Check out Tobi's Rebel Front Tie Skater Dress Brunch or bridal shower, you'll look picture perfect in the Navy Rebel Front Tie Skater Dress. With a waist cut out, the skater dress is looks like separates from the front, with a flared skirt and shawl collar top with wide short sleeves. Try the indigo dress with heeled sandals for fall. Brunch or bridal shower, you'll look picture perfect in the Cream Rebel Front Tie Skater Dress. With a waist cut out, the skater dress is looks like separates from the front, with a flared skirt and shawl collar top with wide short sleeves. Try the indigo dress with heeled sandals for fall. Brunch or bridal shower, you'll look picture perfect in the Blue Rebel Front Tie Skater Dress. 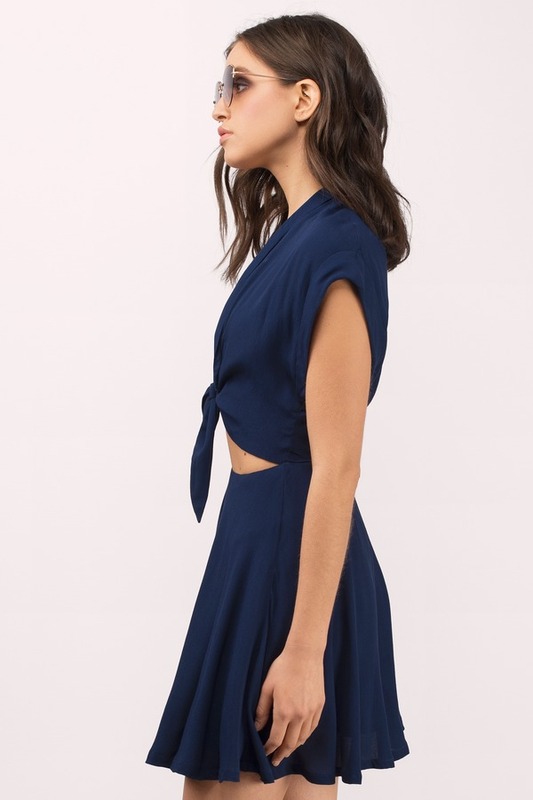 With a waist cut out, the skater dress is looks like separates from the front, with a flared skirt and shawl collar top with wide short sleeves. Try the indigo dress with heeled sandals for fall. Brunch or bridal shower, you'll look picture perfect in the Navy Rebel Front Tie Skater Dress. With a waist cut out, the skater dress is looks like separates from the front, with a flared skirt and shawl collar top with wide short sleeves. Try the indigo dress with heeled sandals for fall. Model's profile: height 5' 10", bust 32", waist 25"